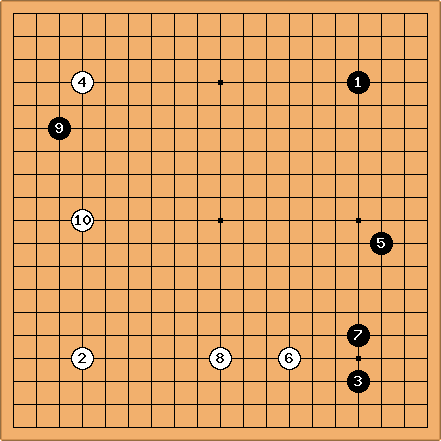 Imagist: Here's another of my attempts to play a moyo game, this time with me as white. 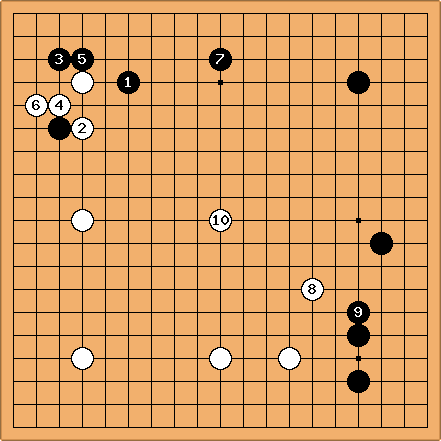 Imagist: I was letting black get a lot of territory, but with the pincer of , I felt like I was developing nicely. Imagist: Up to I fell behind, but and made me feel comfortably ahead. unkx80: Ah... moves like and often makes people feel ahead because they appear to control a much larger area, but in fact the lower left area is all empty, so any invasion is sure to live easily. The difficult thing in this kind of strategy is how to make the stone useful and not end up looking misplaced when Black invades. I'll put it about equal for both sides. Uberdude: I usually play 6 one line above, it still prevents connection, has a better follow up on the corner, and also has better eyeshape(?). Imagist: I was being reduced here, but I was comfortable because my moyo was solidifying into territory. unkx80: I am not sure whether is better played at a or b? I wanted to invade the top right, but seemed urgent. My center moyo was nowhere near enough, as I had expected a little more territory on the left side. 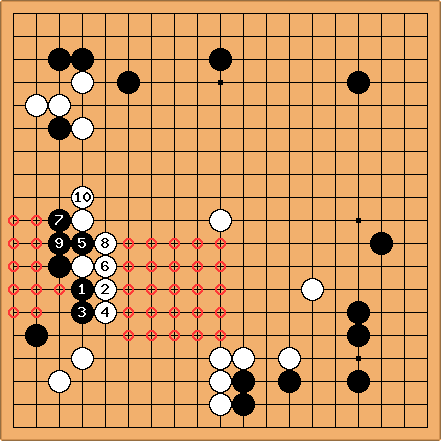 unkx80: Your central moyo has 20 points or so of confirmed territory, but Black made 10 points or so on the left side. But you invested significantly more moves than Black. Ah, the perils of the illusion of big moyos. unkx80: Playing and , followed by seems too greedy. Either you settle the side or you enter the corner with . 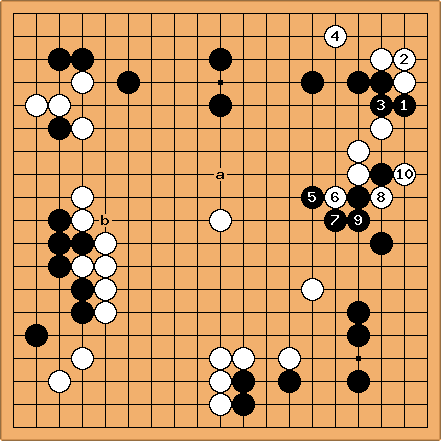 Also, a White move at b seems big, as it gives the White group on the left a base and puts some pressure on the Black group. Imagist: But now I was in trouble. My invasion had failed. I managed to live on the right, but my opponent got a in sente and then cut at b, and despite living again on the left, my center was reduced in the fighting so much that I had to resign.